I won't lie: as a science-fiction writer, I love living in the future. Not just because of the pure gadgetry of it, though that is cool*, but how much easier it is to be a novelist today then it was just twenty-five years ago. But the main thing I have is the ability to work quickly and easily, with a lot of mobility. Here are my tools, both hardware and software. Computer: I've got a MacBook Pro laptop, which is where I do most of my writing. For the most part, I use it on the shared office table where I work with my wife, the two of us sitting across from each other. But my ability to work just about anywhere is something I prize greatly. I think a good chunk of the rough draft of Maradaine Constabulary was written in the car in a drive out to West Texas. For someone who grew up with the idea of a "computer" being a rather bulky thing that lived, planted in a workspace, that's still pretty incredible, even if we now take it for granted. Portable Laptop Station: Handy device that elevates my laptop so it's less straining on my eyes and wrists. I love this thing. If you're interested, google its SKU*** number: UB2400-25J. Well worth it, in my opinion. Scrivener: This is my go-to writing program, and I find it very useful for writing, editing and outlining. 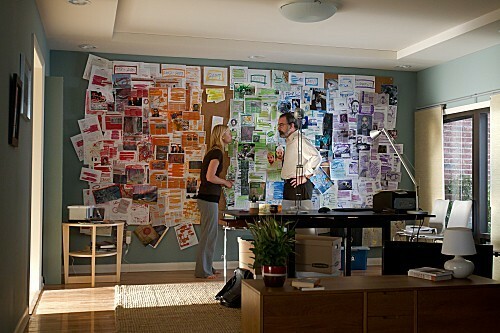 My only complaint is the corkboard/research functions don't let you go full-on Wall Of Crazy. If someone has written a Wall of Crazy program, please let me know. I would be all over that. Because, let's face it, even as dedicated outliner/planner, it's not always a sane or linear process. Freedom: Yeah, that distraction-hungry brain of mine? Sometimes I just have to starve it, and that means just shutting the damn internet off. Excel: I may have mentioned my love of spreadsheets. Especially to keep track of 4.2 million cubic lightyears worth of space. ChView: My beloved, if outdated and unsupported star mapping program. iTunes: To play music for said headphones. *- I mean, come on. I have a device that I carry in my pocket that allows me to have a live video call with someone on the other side of the world, at no extra cost to its standard use. Plus it carries several hundred songs. I have another device that I can easily carry in my bag, with which I can decide I want to read a certain book, press a few buttons and start reading it. I can tell you, 1987 me would have flipped at that. 1987 me had a calculator watch and thought that was freaking amazing, so he might not be the best judge. 1987 me also had every episode of Star Trek on fourteen VHS tapes. DVR would have blown his mind. Sure, I can't do a quick jaunt to a space station, but as far as 1987 me is concern, I am living in Science Fiction. **- Seriously, do you have any idea how many times I've switched tabs and read a few paragraphs of something while writing this? ***- One job I held, back in the Wild West days of the internet, was to take a bunch of SKU-- Stock Keeping Unit-- numbers, and then with pre-Google search engines, try and classify and categorize those various items, as well as dig up some standardized specifications. I don't think that company stayed in business very long.